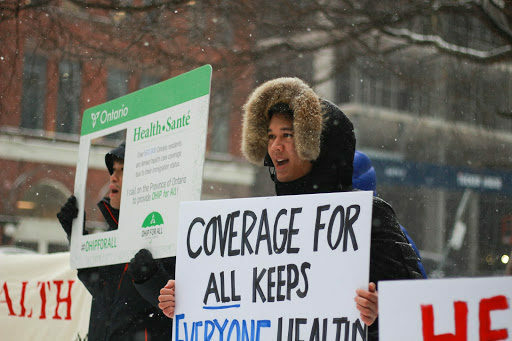 Health-care rights activists gathered outside the Immigration and Refugee Board building in Toronto on Feb. 12 to protest the federal government’s denial of health care services to uninsured migrants. The rally, held at 74 Victoria St., was part of a countrywide day of action organized by Health Care for Migrants and OHIP For All, with 17 cities across Canada hosting demonstrations. There are about 500,000 uninsured migrants in Canada, which includes new immigrants, foreign workers, people in-between visas and people without immigration status, according to a Toronto Public Health report. Melanie Spence, a registered nurse and OHIP For All member, spoke about the rally’s purpose at the beginning of the demonstration. The movement came to the forefront last year when Nell Toussaint, a Grenadian woman working in Canada, brought her case to the UN Human Rights Committee. Toussaint, 49, moved to Canada in 1999 and developed a number of health conditions, but was unable to access the necessary services due to her immigration status. “She had 22 years of severe chronic pain for her treatable condition due to her inability to pay for care,” said Arnav Agarwal, a resident doctor and the lead organizer of the protest. Toussaint brought her case to the UN Human Rights Committee, which condemned the Canadian government and gave it 180 days to amend its health-care legislation. On Jan. 29, the Canadian government released an email statement saying it is “unable to agree with the views of the Committee in respect of the facts and law in the communication and will not be taking any further measures. 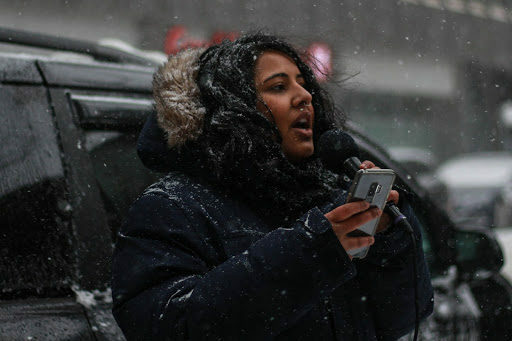 Many activists who participated in the rally work in the health-care industry and were inspired to join the movement after witnessing the first-hand effects of inaccessible health care for migrants, said Agarwal. Many of the treatments that uninsured people need are unaffordable due to lack of regulations on hospital fees. New immigrant workers often find themselves in dangerous workplaces where lack of oversight makes injuries more common, said Sang-Hun Mun, a South Korean immigrant and member of Injured Workers Action for Justice. Precarious work environments and lack of health care accessibility forces many injured workers to choose between health and income. “So many times I have to have long, detailed conversations with people, pleading them to go to the hospital, but they’re so afraid,” Rai said.